"I signed on to battle Groo! Why do I keep having these urges to do away with myself?" When you're recognized for skills in combat, people go out of their way to avoid you. They fear the combat as a direct influence on their longevity. It's not that often that people avoid you because they're scared of what disaster you'll bring along. In Dark Horse Comics, Groo: Friends and Family #1 brings a character rife with problems. The issue is written by Mark Evanier, illustrated by Sergio Aragonés and colored by Tom Luth. Each month of this yearlong series, Groo and his faithful pooch, Rufferto, encounter a different acquaintance--or enemy--with the usual dire consequences. 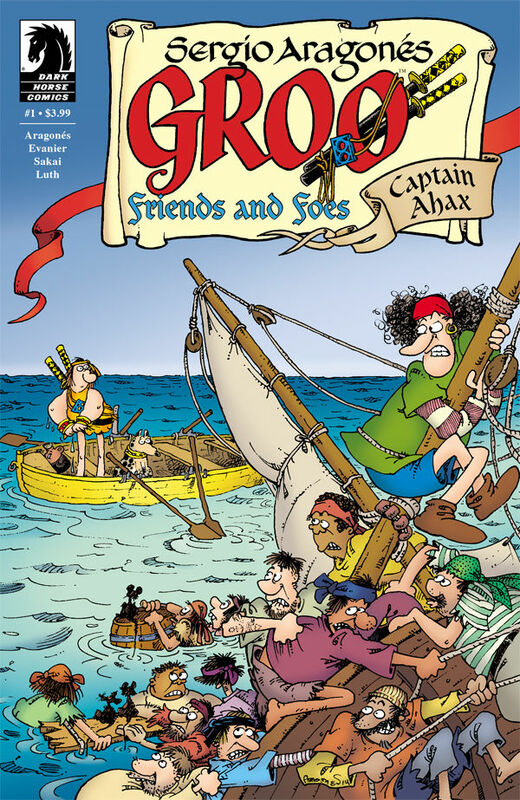 In Groo: Friends and Family #1, Groo crosses paths with Captain Ahax, the seaman with the world record for most ships sunk by the all-time stupidest character in comics. To say that Groo defines the idiom "best-laid plans of mice and men oft go astray" is an understatement. He's a character who everyone fears for many of the wrong reasons, most of which surround his propensity for calamity. 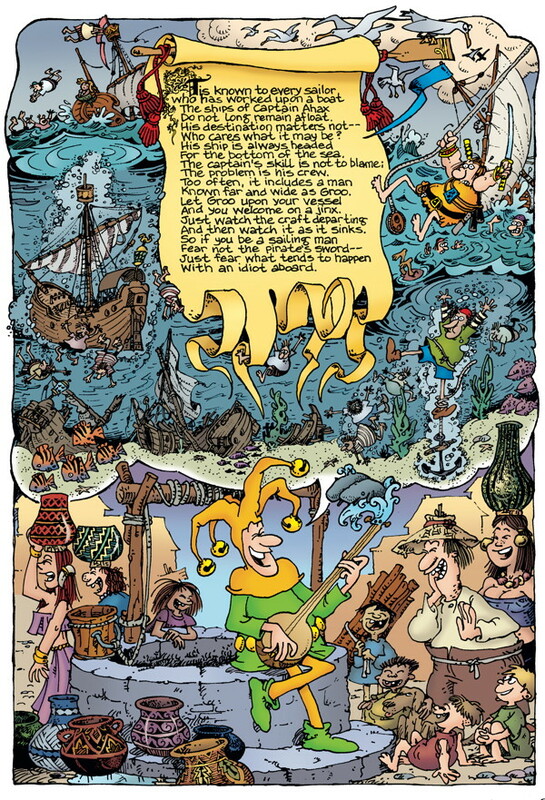 Evanier does a great job reiterating this to the reader, presenting every new character in utter fear of any and all bad luck Groo will bring upon them. The plot behind the first issue is actually pretty intriguing, as it taps into the expectation that Groo will cause destruction and it can be profited from. Tempting fate is always a tricky proposition though and it turns out that Evanier has some rather humorous consequences in store for those who take part. 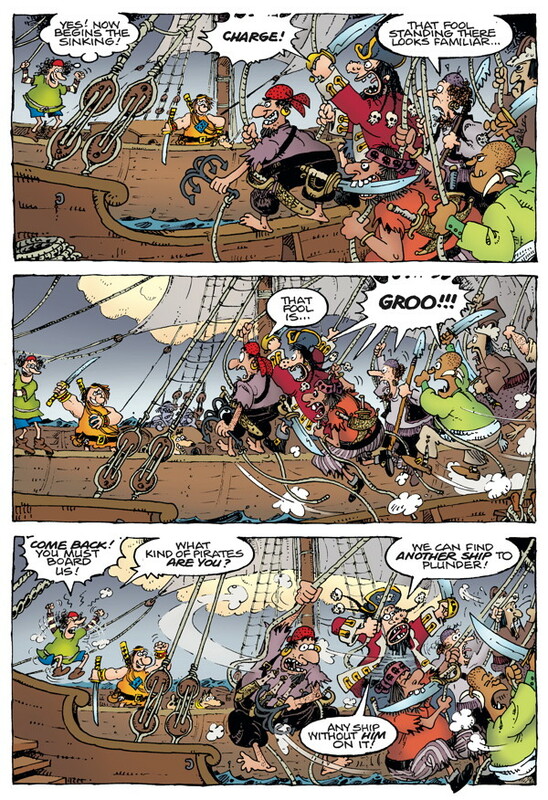 One of the biggest charms of Groo: Friends and Family #1 is the newspaper strip sensibility of the art style. Aragonés infuses the book with a style that's cartoonish and intricate in its own right. Each scene is full of detail, with every panel delivered as if it's teeming with action. Aragonés exaggerates the facial expressions of all the characters in a way that increases the comedy. And Luth's colors stand out further due to the empty gutters, with the green shirt of Ahax contrasting well with Groo's sharp orange in a bold fashion. Groo: Friends and Family #1 is entertaining and amusing. 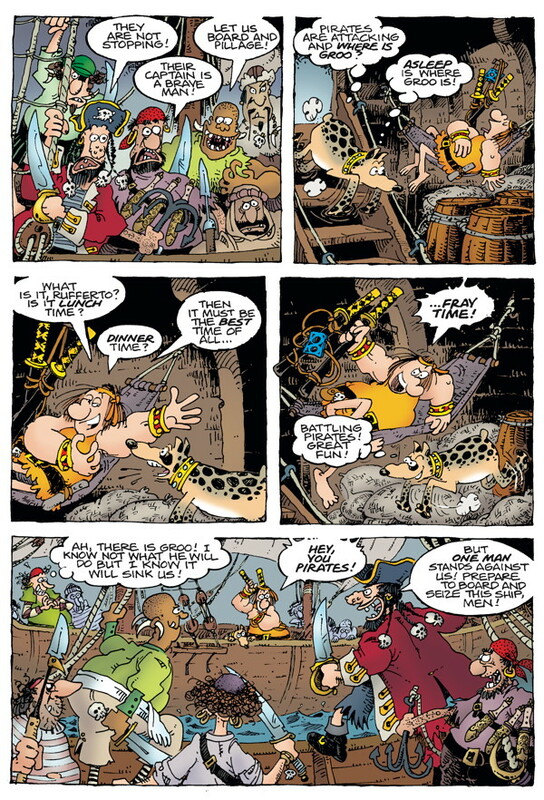 Groo is a walking disaster, so much so that his reputation does more to protect him than he perceived combat ability. Evanier keeps things light and maintains the major plot points without delving too deeply in the minutia. Aragonés gives the book the equally adventurous look to it that reminds the reader there is comedy in watching lives get destroyed by one man's ineptitude. Groo: Friends and Family #1 is a lot of fun to read and doesn't take itself too seriously, promising to the be the start of a series that's likely to be just as entertaining. 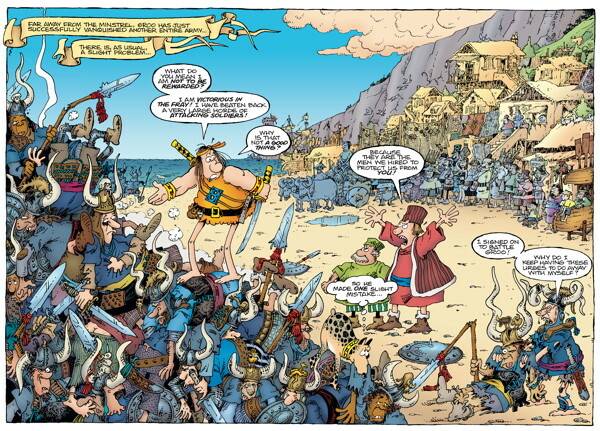 Groo: Friends and Family #1 is in stores January 21 with interiors below.